My name is Pak Savorn and I am 48 years old. I live with my husband, three daughters and mother-in-law. My husband is a motor-taxi driver and I am a housewife. During the planting season, I make money by planting rice. The rice fields are the most important resource for bringing me relief. They make me calm and happy. The beautiful quiet atmosphere of the rice fields, the forest, the cool breeze and being on my own all make me happy and bring me relief. 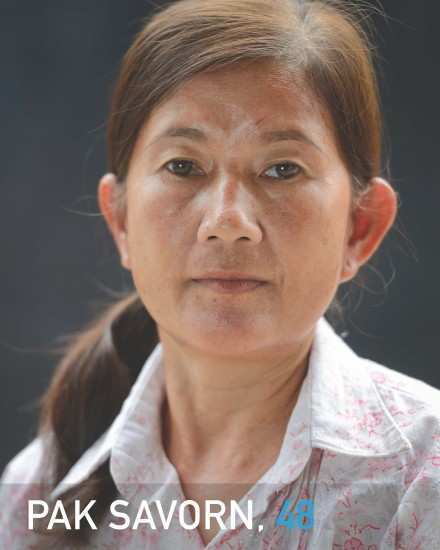 I was born in 1964 in Svay Rieng province in a family with nine siblings: four brothers and five sisters. I am the youngest. My parents were farmers. Even though we were farmers, our family enjoyed good living conditions during that period. When I was about eight years old, I could take care of the cows and the water buffaloes, and I felt very happy at the time. I could not go to school when I was old enough for that because we lived in fear of bombs. I was so frightened at the time. When I think of it now, I am not afraid anymore, but my heart still beats faster. I feel sad about losing family members and others as a result of the bombings. Some of my eight siblings went fishing, some carried fertile soil to the rice fields and I took care of the cows and water buffaloes. In 1975, my family was deported from Svay Rieng to Svay Doun Keo, in Battambang. Pol Pot (1) caught two of my brothers to go ‘study’. (2) Their names were Bou Soun and Bou Khorn. My family worried that my brothers were going to be killed. When I think about my brothers, I feel heat radiating from my body and it feels as if it is all happening again right now. I really miss my brothers. We went from Svay Rieng to Svay Doun Keo by train. There was fighting and gun shots along our way. We reached Svay Doun Keo and were told to sleep under the trees. Those of us who came from Svay Rieng were told to go to Kar Ko Mountain and build dams. People built huts and the Khmer Rouge assigned one to each family. My brother had been told to make buckets in Russey Kraing village, Moung Russey, Battambang. My father worked to make dorng kan trorb (3) and my mother harvested hay. One of my brothers worked in a mobile team. I worked in a children’s team taking care of cows and water buffaloes, making organic fertilizer and also planting rice. I told my team leader that I was experiencing difficulties, but the Khmer Rouge asked whether I was sick or not. I told them that I had a headache and they gave me a traditional Khmer medicine called ‘rabbit poop’ (4), which helped me with the headache. Later my team leader asked someone else instead of me to take care of the cows. While I was taking care of the cows in the rice fields together with two other children, we saw dead bodies that had not been properly buried. I was so frightened, also because of the bad smell of the corpses. When I now recall what we saw there, one side of my head hurts a lot, I have blurred vision, and it feels as if it is all just happening again. My heart beats faster and all those frightening feelings come back. When this happens, I think of the rice fields, and I imagine the view surrounding my home, the smell of water herbs (5), and feel the breeze on my face, which brings me some relief. In those days, I also had a relapse of measles and suffered from bleeding. My health was not good at the time, so I asked my team leader to see my father. I thought I’d die from measles. I walked alone through the forest and mountains to see my father. When I heard a wolf, I was so frightened. I feel scared again just talking about it. For two days, my father collected Khmer traditional medicines and boiled them for me. I recovered and went back to my mobile children’s team. I worked very hard and did whatever they told me to do because I was afraid of being killed like others in the camp. One day around 8 am, I witnessed one of the children being tortured. The child was part of the ‘17 April People’ (6) who were from the city and who could not bear the hard labor. The Khmer Rouge beat the child with a stick until it fell down into the water bleeding all over. I witnessed this cruelty and approached the Khmer Rouge to help that child, but they warned me that they would also kill me. So I went back to do my own work. When I recall this these days, I still experience shock and fear. My head gets tense, my neck feels numb, my heart beats fast and my whole body gets hot. I massage myself, drink a glass of water and leave the room to take a deep breath. I manage to feel a little better when I do that for a while. I heard that my brothers and sisters were killed while I was in the mobile children’s team. I feel very sad about this great loss and I keep asking myself ‘Why did the Khmer Rouge kill them? What did my brothers and sisters do?’ I feel tight in the chest, I can’t control my tears and sob. I try to breathe in and out deeply and think of the rice fields so that I can release my feelings. At the end of 1978, my whole family was displaced and forced to live in the mountains, including my brother, sister, niece and parents. At the time, the Khmer Rouge were deporting people from Svay Rieng; they were called the ‘East Group’. (7) The Khmer Rouge cadres gathered people who were strong. There were thousands of people standing there in the one place. The Khmer Rouge threw bombs on those people and sprayed them with gasoline, putting them on fire. That was so cruel. I witnessed this and cried, but I also grabbed some soil to put on my head and made a wish to my motherland to protect me. In the end, my family survived this. The Khmer Rouge then called a meeting with the rest of the people and asked if anyone wanted to go home. I did know, though, that when they asked those people whether they wanted to go home, they would in fact take them away to kill them, one by one. They told us to get pans and plates, but of course they were going to kill us. Those Khmer Rouge cadres were about 15 to 17 years old and there were only ten of them. They killed the men first and then the older women and children. Soon enough, it was my family’s turn to go get our pans and plates. They tied my family members up and escorted them to the killing place. They called us ‘Vietnam Heads’. (8) First they beat my father with a stick until he died. Then they beat my sister six times with a stick and stabbed her many times while her children were thrown to the ground. My mother was also beaten to death, as was my brother. I was the last one. I was in shock and do not know how many times they beat me with the stick, but I noticed that afterwards, there were many dead people lying on top of me. I tried to push them away and get myself out of the grave. There was blood all over me and it smelled horrible. Worms were coming out of the noses, ears and mouths of the dead people. I realized that my head and my ears were hurting very much. Only I and my sister survived. While I was unconscious, my soul was somewhere in a happy place for three days, but when I woke up, there were many corpses instead. I did not know what to do at that time. I felt lost because my family had died and only my older sister was left. She was injured, bleeding and crying out for water. I moved towards her and got her some water from inside the grave and asked her to drink it. I also drank it as there was no clean water available at all. I feel as if it is all happening again just now, and I see how the Khmer Rouge killed my family and other people. My heart is beating fast, I have a headache, experience tightness in the chest and find it difficult to breathe. My toes and fingers become cold and I feel fear. My therapist has taught me, when this happens, to breathe in and out deeply and slowly, and to check what the current date and year is to bring me back to the present. My therapist also tells me that the Pol Pot regime is over and that there is now a tribunal taking place that is prosecuting the Khmer Rouge. I also massage myself and drink a glass of water. It takes some time for me to start feeling better and relieved after that. Two or three days later, my sister and I met other survivors from the executions. We, twelve of us in total, sat together under a tree. Some were as seriously injured as my sister, and some of them were even more seriously injured. In the team, I was the healthiest. I went out to collect some rice and water from the corpses to cook for the survivors. We all continued our trip without any clear direction. Five out of those 12 survivors died on the way due to the severity of their injuries. Early 1979, I traveled back home, full of fear, with six other survivors. Along the way, we stopped and slept cautiously under big trees. We encountered many wild animals. One day, I saw a red cart similar to one belonging to the Khmer Rouge. We were very scared. We ran away and hid in the jungle. I could not run away from my belongings. I begged them not to kill me. An old man allowed me and the six other survivors to ride in his cart. He took us to get treatment in Pursat referral hospital. Fortunately, in the hospital, I met one of my brothers, who had survived and was living in Moung Russey, in Battambang province. He also brought his wife to get treatment. After I was reunited with family members (9) and my wounds were healed, my brother and I went to live in Pursat town until 1981. In 1982, we moved to Buntey Dei village, Sangkat Bunteay Dei, Pursat town. I went to school starting in grade 1 when I was 15 years old. I dropped out of school in grade 6 because of my family’s circumstances. I went to pick rice in the field so that I could help with the food shortage in my family. Two years later, in 1984, my brother worked as a laborer and my sister stayed at home and cooked because she could not do any heavy work. In 1985, I married a man who lived in the same village. We had our first child after three years of marriage. After we got married, my husband worked as a laborer, wood cutter and construction worker. Our financial situation was not so good because we didn’t make much money from his work. Nowadays, my husband works as a tuk tuk driver and as a laborer in the rice fields, depending on the seasons. My current situation is much better and we have no issues within our family. My first daughter got married at the age of 22 and I now have two grandsons. My second daughter is 16 years old and is in grade 10. My youngest daughter is 12 years old and is in grade 6. Even though the Khmer Rouge regime has been over for more than 30 years, the suffering it caused my family and me remains in my mind. I will never forget it. For this reason I decided to file a complaint with the Khmer Rouge Tribunal through ADHOC (Cambodian Human Rights and Development Association) in 2009. Mrs. Chet Vanly is my lawyer. I seek justice for my family and search for the truth. I also would like to see a stupa being built so that we can put the names of the survivors and their memories there for the young generation to learn about the past. 1 Saloth Sar, alias Pol Pot, was the leader of the Khmer Rouge and as such he was also the prime minister of Democratic Kampuchea, as the Khmer Rouge regime was officially known, from 1975 to 1979. Cambodians often use the name ‘Pol Pot’ as a synonym for the ‘Khmer Rouge’. 2 During the time of the Khmer Rouge, people knew that this term referred to being severely punished, most likely killed, because no one ever came back. The Khmer Rouge didn’t say directly that they were going to kill someone, but used other words instead, such as ‘to study’. For the Khmer Rouge ‘to study’ stood for ‘enduring punishment’, but in reality hardly anyone survived the punishment, hence it indirectly meant ‘being killed’. People knew what they had to expect when the expression was used. 3 Sliced bamboo sticks that are used to build roofs. 4 A traditional Khmer medicine that looks a little like rabbit poop. 6 This refers to the people who were deported from Phnom Penh on 17 April 1975. They were treated very badly and were the main target of the Khmer Rouge. 7 After assuming power, the Khmer Rouge abolished the old provinces and replaced them with seven zones of which the Eastern Zone was one. 8 They are accusing them of being loyal to Vietnam. 9 Her brother and sister who survived.